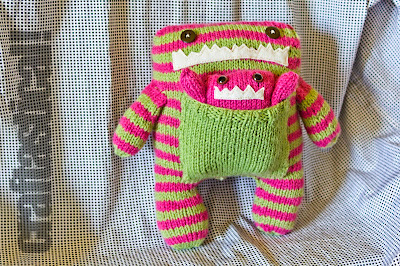 I was just about to start writing this post, and as some reconnaissance, I casually asked my daughter if she had a name for her knit monster toys. She told me no, and that she "didn't necessary like them that much." Ahhh, the fickleness of four year olds. And here I was, all prepared to rave about how much she loved these monsters. Direct quote after asking her about her monsters, "I'm getting super mad at you for not letting me [eat] anything." I'm sure I seem like the most horrible mother ever, making her wait 10 minutes to eat until dinner is ready. So, her dislike might have been influenced by her rumbling tummy and my horrible mommy meanness. I love these monsters. If she doesn't like them anymore, I will start sleeping with them at night. I went to five different fabric stores looking for real wool felt to make their mouths. I carefully selected the yarn. I agonized over what type of eyes to use. I even had to use double pointed needles! 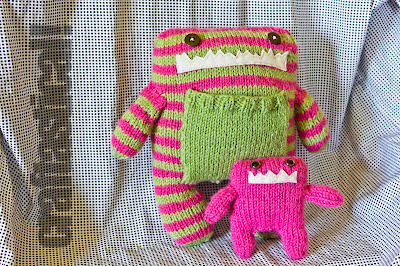 Heck, I may even change out the yellow in my gray and yellow bedroom to pink and green to match, I'm so darn fond of these little monsters. 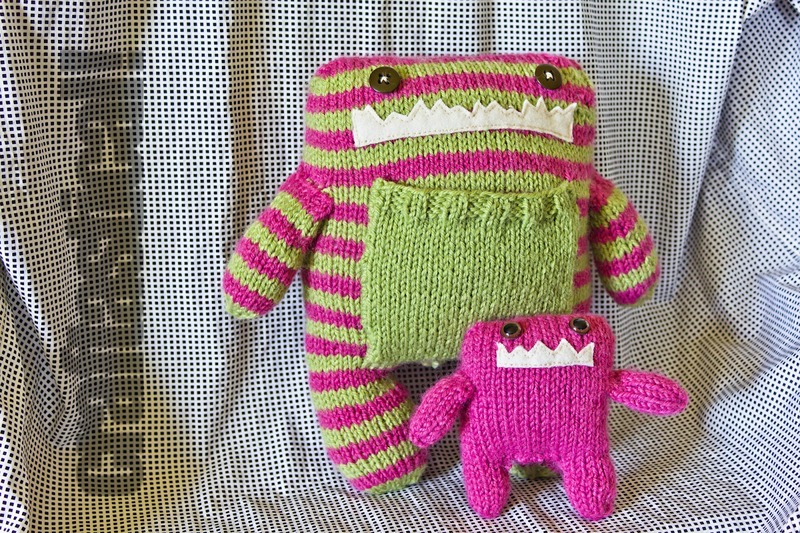 They were knitted using this pattern, by Rebecca Danger of Danger Crafts. 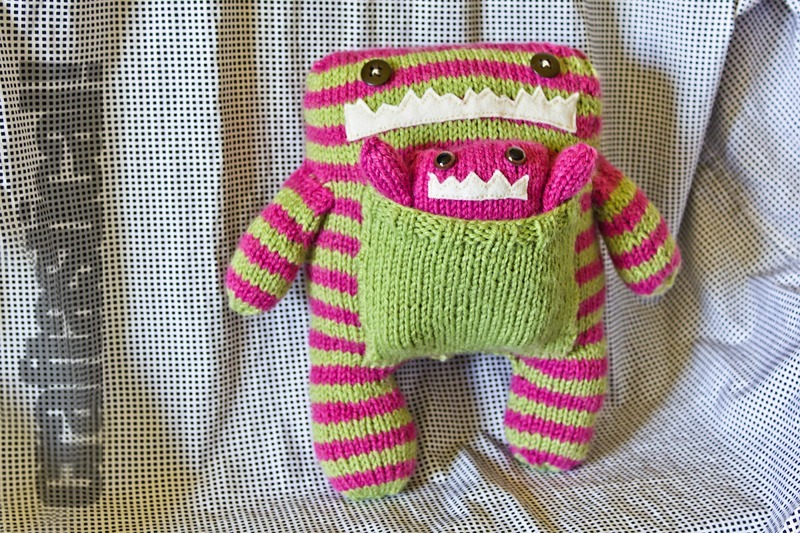 It's kind of rare for me to use a pattern, but this one was easy to follow and worth every penny. I made my nephew a pair for Christmas that were gray and dark blue. As far as my sister reports, he's still delighted with his! How could you not love their little faces?? Aubrey will come to her senses after dinner. I feel like if I don't learn how to do something new on a project, I've somehow cheated. On this project, I mastered stripes. I tried this jogless method (the traveling one--the first one described), and I learned how to change colors, carrying them up and twisting them before changing. 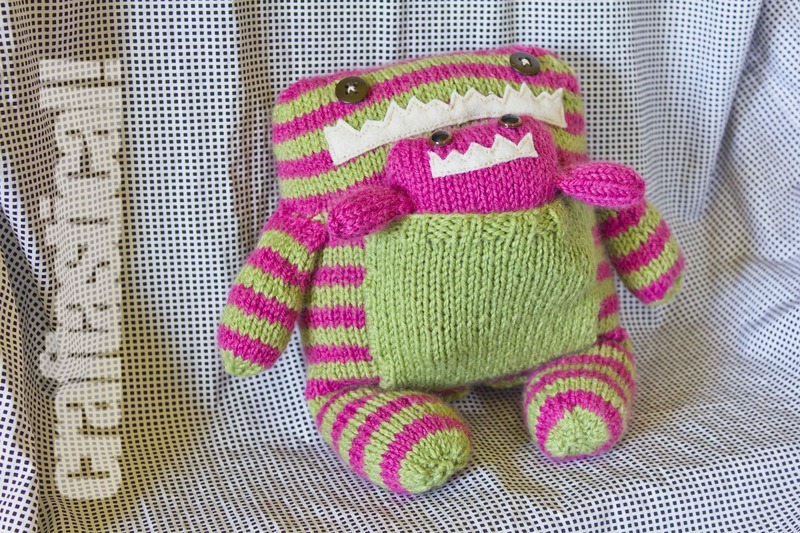 I've got the whole knit stripes down now, and they don't scare me anymore. Take that, knit stripes! I will take you on, any time, any place. I can knit stripes, chew gum, watch TV, check my email, and arbitrate hellish sibling MMA fights all at the same time. I'm pretty sure if I can do that, there isn't anything I can't do. Pretty sure. These are too cute! I love them!